Latest Movie Poster of 3 Idiots, Vidhu Vinod Chopra’s 3 Idiots, Aamir’s 3 Idiot, Aamir an Idiot in 3 Idiots, Free Movie Review of 3 Idiots, Kareena and Aamir Starrer 3 Idiots. Finally, the wait is over for Vidhu Vinod Chopra’s next film “3 Idiots”. Starring Aamir Khan, Sharman Joshi, Kareena Kapoor and R. Madhavan, “3 Idiots” as the name suggests will be a comic treat. 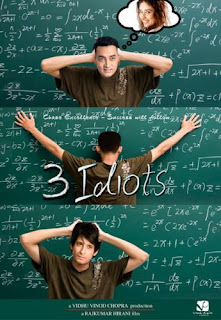 Watch out for its first poster showing three idiots in a funny way standing in front of a black board. The poster shows a classroom and gives an idea of a story about three students. Directed by Rajkumar Hirani, “3 Idiots” is based on Chetan Bhagat’s novel “Five Point Someone”. Shantanu Moitra has composes the music for “3 Idiots” and you will soon be able to hear it. So, get ready to watch out this comedy adaptation of Chetan Bhagat’s “Five Point Someone”.